I've got a super simple New Years Resolution for your family: PLAY MORE. Easier said that done, right? 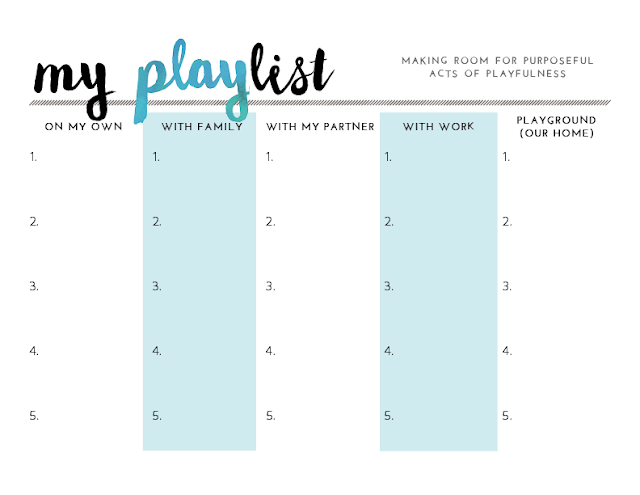 That's why I've created this simple template for your family to print, fill out, and tape to the fridge so it's right smack in the middle of your day. When filling out your playlist, try to include both big dreams and smaller play breaks. These can be plans you save up for, or cost nothing at all. You might not accomplish everything on the list, but that's not really the point. As long as you're inspired to find a way to play together. You'll notice there are a few different categories on this list. That's because finding some time to play for yourself is just as important as playing with the kids. Cheers to plenty of play in 2017!